When we left Michigan we were on a mission to get to Colorado by June 27th, which gives us a month to explore that whole state and a month in Utah before we head to Seattle to catch our cruise to Alaska in early September. So we moved fast spending only one night in all but one place. 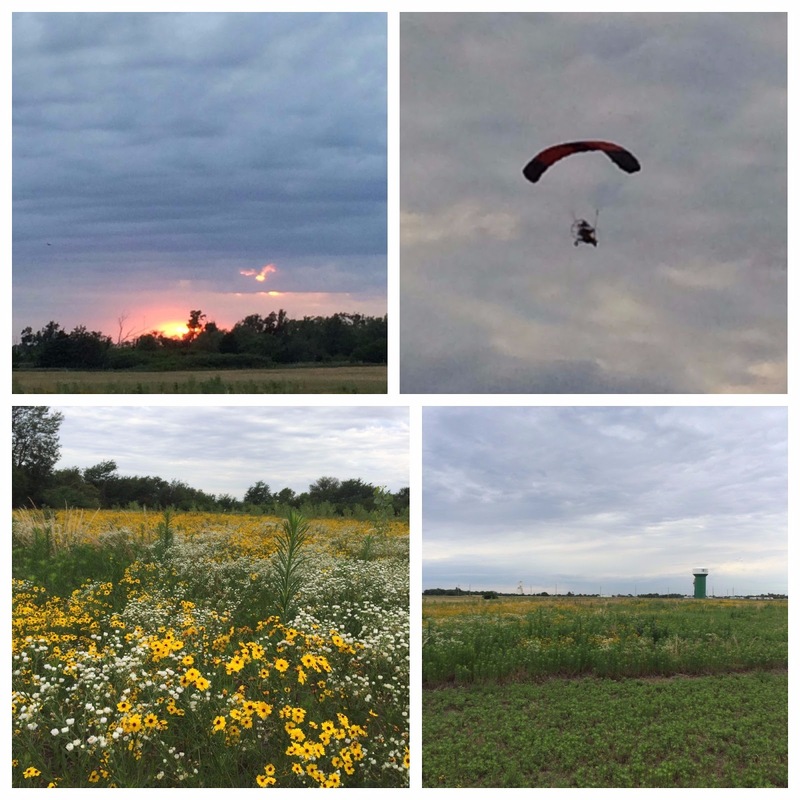 The first days drive of 217-miles took us to the Wildwood Outdoor Escape. We spent the night of June 20, 2017 here. It is a large campground with over 100 sites and a tent camping area. The sites are all grass and not exactly level but plenty long enough for the RV and tow-dolly. They are wider than normal and include a picnic table. We had water and electric but no sewer hook-up. WiFi was not great but our Verizon signal was strong. We paid $19.26 for the night with our Passport America discount. 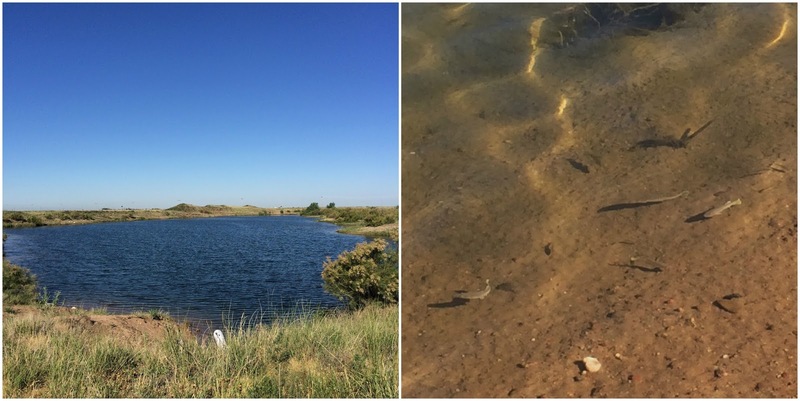 There is a fishing lake and a swimming hole with a small beach. They have a volleyball court, playground, putt-putt golf and organized activities. Our drive to Hartford City was interesting. We thought smooth sailing awaited us as Indiana is pretty flat. Well, about half way to the campground we heard this clanking noise from outside the RV. We pulled over and discovered that the screws that hold the side panel under the drivers door had worked loose. The panel was flapping in the wind. So Les was trying to put in new screws on the side of the expressway while Nancy was praying he wouldn't get hit by a car or truck! After two stops, a couple of screws, some duck tape and wire we got it secured down. Never a dull moment in our lives. 233 more miles down the road we arrived at Tom and Carol's RV Park on June 21. Another interesting story. First, GPS had us make a right turn, when we should have turned left. Seeing we were in the middle of farm land we had to drive about 5-miles to circle back to the right place. When if we had turned left we would have been about 1,000 feet from the park. We finally get to the RV park and pull in only to discover there is no way out and we can't back up with the tow-dolly on. So we dropped the car and removed the tow-dolly and hooked it up to the car. Then we backed the RV out of the park. This was necessary as we needed to drive to the fairgrounds because there wasn't room at the RV park. Really, we can't make this stuff up. We get to the Platt County Junior Fairgrounds just a couple blocks away and pull into our site only to discover that someone has stolen the 50 amp outlet. We move to the next spot where we can finally set-up. It was a very long day and close to 100-degrees out which makes it very hot inside. Our site was right next to one of the buildings and our door opened onto the road but it was only $10.00 for the night so you can't really complain. We had 50 amp electric and water hook-up. There was no WiFi but our Verizon signal was good. On June 22, our 183-mile trip took us back across the Mississippi River. 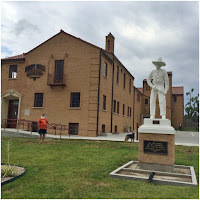 We spent one night at the Mark Twain Landing. This is another large campground with over 200 RV sites along with tent sites and cabins and condos to rent. They have two catch and release ponds, a swimming pool, putt-putt golf and a number of activities. 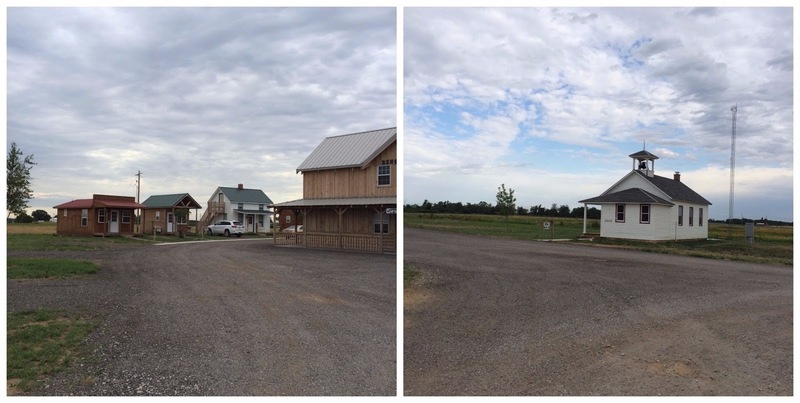 There is a small restaurant that serves pizza and wings and a general store with all your basic needs. We were in site 187 and it is one of the more private ones. The pads are cement and the sites are wider than normal with a picnic table and fire ring. The only draw back is the water connection is on the wrong side of the RV, a good 50-feet away. Luckily we had long enough hoses. WiFi was not very good but our Verizon signal was strong. We paid $28.24 with our Passport America discount. This was our first Casino RV Park. After driving another 254-miles we arrived at the Prairie Band Casino Resort. We spent the night of June 23rd here. The RV park with over 50 sites sits behind the casino. The sites are all pull through with full hook-ups.They are cement pads, very level and the grass area is wider than normal. They do not take reservations but have never had to turn anyone away. The park is very well maintained and really quiet. The bathrooms and laundry were exceptionally clean. The WiFi was strong as was our Verizon signal. We paid $26.50 after a $5.00 discount when we signed up for the free Players Card. We took the free shuttle from the park to the casino and then walked back. Once we got our Players Card we wandered around a little but neither of us are big on gambling plus they allow smoking through out the whole building so we didn't stay long. The 208-mile trip on June 24 to South Hutchinson took us through Florence, KS. 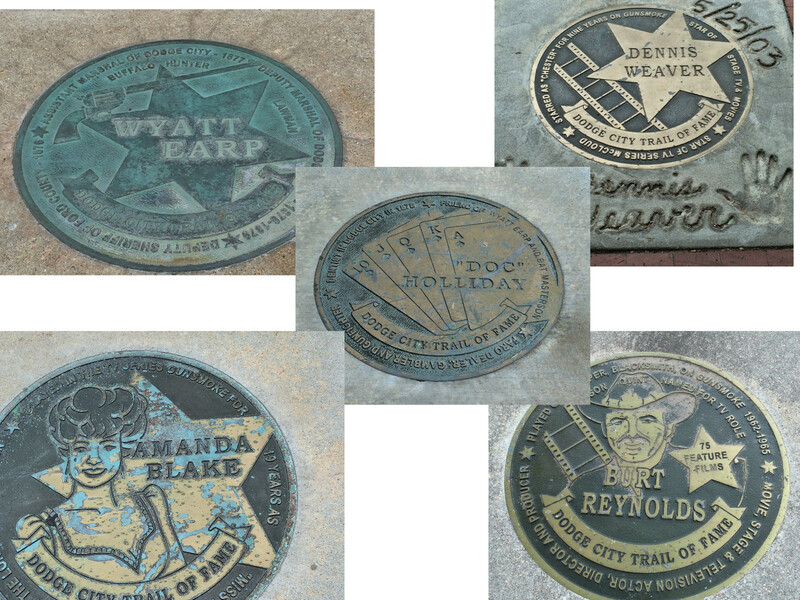 We have found so many towns with Nancy's mom's name. We also saw a number of fires along the way - all controlled burns. The drive should have been closer to 180-miles but Nancy's navigational skills failed us a bit and we took a little detour. The Light House Landing RV Park was a nice surprise. We were expecting it to be noisy as it is right off Highways 50 and 14, nestled behind a sporting goods store and a truck stop. It was actually one of the quieter places we have stayed. It is a fairly new park and it has about 30 sites and four cabins that you can rent. It is designed to give you the feeling of an old frontier town on the prairie. The office is in an old school house and the bathrooms and laundry building are made to look like a bunk house. The sites themselves need a lot of work, we pulled into three before we found one that was close to level. They are all gravel pull through, with full hook ups. They are on the narrow side and the grass area is all weeds. The camp is surround by prairie fields some filled with wild flowers. Just before the beautiful sunset a glider flew overhead. The owners are working on improvements so things should get better. WiFi was good and our Verizon signal was strong. We paid $17.00 for the night with our Passport America discount. 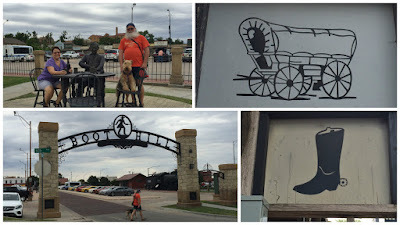 On June 25 we made a stop about half way into our 185-mile trip to check out Dodge City. We were more than a little disappointed. We were expecting something along the lines of Tombstone, AZ, which we visited in March 2016. There really is nothing here except one museum. The walking tour takes you past mostly empty store fronts with a few hair salons and restaurants thrown in. 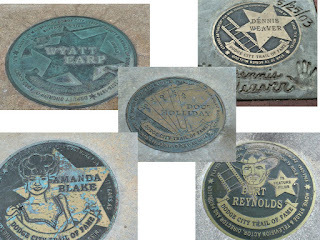 We walked the Trail of Fame which has stars in the sidewalk recognizing people who share in the history of the town, who helped build the town and who starred in the TV series Gunsmoke. There is a brewery and a distillery but seeing it was noon on Sunday neither one was open. 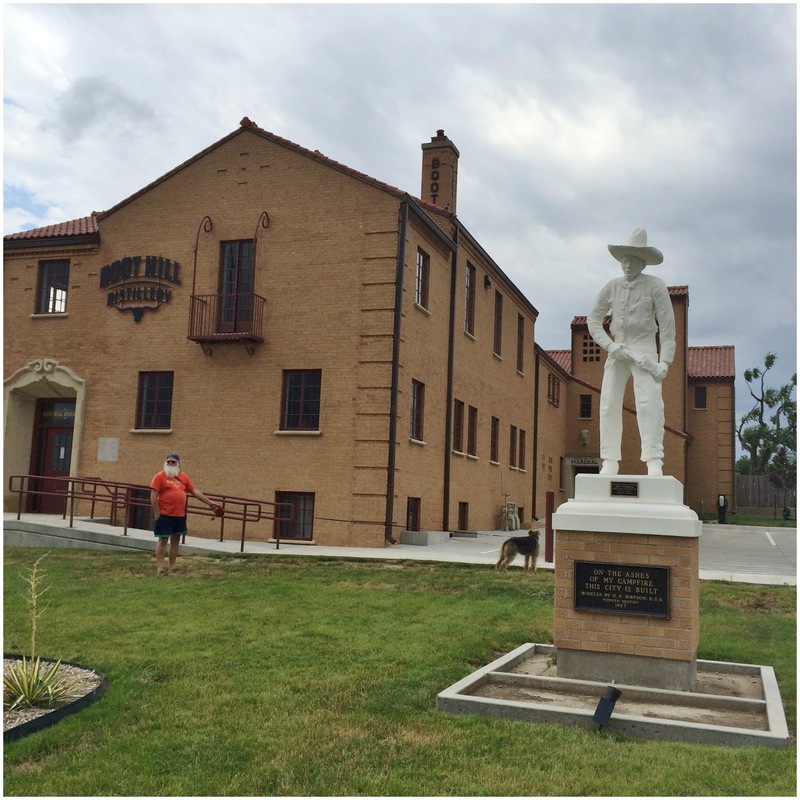 After leaving Dodge City we hit our last stop before Colorado. After six days of straight travel we needed a day of rest so we spent two nights at the Deerfield Beach Campground. This place was a surprise too, but not a nice one. It is probably one of the more dingy places we have stayed. When we pulled in we both looked at each other with quite a surprised look on our face. The majority of sites are permanent residents and most of them are not kept up very well. The sites are supposed to be all pull through but they are not, the site we pulled into didn't have anyone in either site so we were able to pull through one to get to the other. This means we were able to leave the car on the tow-dolly. The sites are all weeds and not very level. Our site along with the rest of the place had trash on it, an old hanger, broken grill brush, bags, to name just a few things we saw. There were also 1000's of grasshoppers which was kind of fun - every time you took a step they jumped all over, which of course freaked out poor Mielikki! 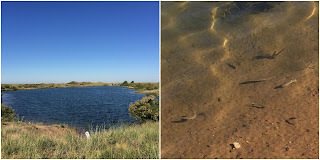 There is a small lake which we guess is where the Beach in the name comes from. It seemed well stocked with fish. It is very quiet here which worked out fine for a place to just stay put for a day and catch our breath. There was also a pretty sunset one night. We paid $15.00 a night with our Passport America discount. We would have been pretty unhappy if we were paying $30 a night for this place! 1,280 miles in six days, a new record for us. Another 227 and we will be in Pueblo, CO.
You never know when something will go wrong while you are driving and you have to pull over and stop. There are some things to consider when this happens. ~ 1. If you can make it to an exit that is the safest way to go, pull off and park in a parking lot or some where out of traffic. ~ 2. If that is not possible and you need to stop right away you want to pull as far off the road as you can. ~ 3. If there are two of you have one watch traffic while the other works on the car or RV. On our first stop I was able to watch out the window and tell Les when traffic was coming so he could step around to the front of the RV. ~ 4. Entrance ramps also make a good place to stop. Our second stop came just as we passed an exit, so we pulled over on the shoulder of the entrance ramp. This put us out of fast moving traffic and gave us a little more space for moving around. Just be aware of your surroundings, turn on your flashers, and do just what needs to be done to hold you till you are in a safe place to stop.